Inking Idaho: Icing On The Cupcake! 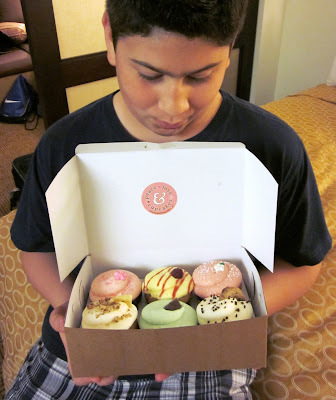 Before we left for California, our baker son Benjamin informed me that he was a fan of the Face Book page, Icing On The Cupcake and while we were in Roseville he wanted to go see them. How he finds these things, I don't know but if there is a cake shop within 20 miles of anywhere we travel, he knows about it! So...when I was talking to Suzie, my upline in Roseville, I was telling her we had to find this cupcake shop. She said the cupcake girls are stamping customers of hers and they would be at her class Tuesday night while we were in Roseville...what a small world! We rolled into town about 5 pm, quickly got something to eat, dropped the guys off at the motel, changes clothes and I headed over to Suzie's to crash her class. Low and behold, Miss Suzie had told the cupcake ladies of our story and Head Cupcake, Shirley, had a goodie bag for Benjamin!!! I wish he had gone with me, but after 10-1/2 hours in the car, he chose swimming rather than following me to the class...can't blame him. When I returned to our motel, I walked in with the loot and Benjamin about passed out! There was a t-shirt, a dozen mini red velvet cupcakes and a half dozen of assorted full size cupcakes all wrapped up and packaged DARLING!! You know how we stampers ♥ our packaging! We immediately had to have a sample platter of all the cupcakes, right?? To die for delicious! I've eaten a lot of cupcakes and cupcake shops are everywhere...well let me tell you, not all cupcakes are created equal! These are fabulous. 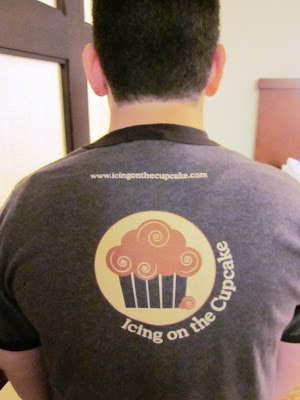 If you are in the Roseville/Rocklin area, check out Icing on The Cupcake. They are also opening a store in Folsom and Sacramento soon! We went to the cupcake store the next day and I bought cupcakes for my downline meeting, one to eat that night and one to take home in THE most darling little to-go boxes they provided, and I didn't even take a single picture! Dang me! Shirley, thank you for your generosity and caring heart in making my little boy SO happy! I immediately whipped you up a cupcake card and put it in the mail! You're the best!! What a GREAT story Becky, and such a happy memory for Benjamin! Thanks for sharing. Oh my, Becky! What an awesome story! Thank you for sharing! I am sure your son will remember this and treasure this for a long time! Icing on the Cupcake is VERY well known here in South Placer County! How fun that they will now be well known "nationally" through your sharing! LOL! First, what a darling story. And I LUV that t-shirt! Second, I live just a few miles from Roseville and could have handed you my check for the darling purses instead of mailing it! Small world. Becky, this is such a GREAT story -- and the pics to go with it! You MUST send it to the SU! people! I bet your baker son gets in the next Stampin Success! :) We always talk about the great friends we make and this really shows how small the world is and SU! people are the best! Oh, Becky...how nice of you to post this story...the USA has been getting so much negativity since the oil flood & this is much more refreshing today....thank you 10 times over!! I live in Roseville and I've passed that shop many times. I guess I ought to go in, huh? I'm pretty sure my demo is one of your downlines. Small world, indeed! You were in Roseville???? :o( Miss you. And I'm going to make my Christmas cards this year darn it! !I'll have to check that place out. I've never heard of it. Susan L.
Happy Birthday Benjamin. What a lucky guy you are. Becky you just may have the next Cake Boss or Cake Ace on your hands. That is so wonderful!! I think your son has a future in cupcakes! From some of the other posts you have had on your blog, I think Benjamin definitely has the passion (which I share) for cake decorating. 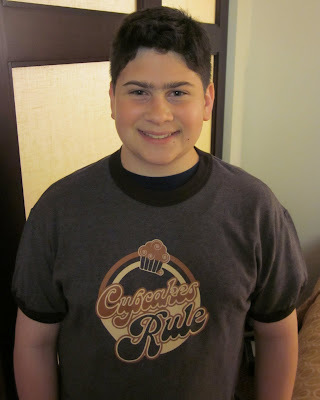 I think it's fantastic that he finds all the great dake and cupcake places. What a wonderful story and it sounds like you had a wonderful time on your trip! That is the greatest story ever. Benjamin is a lucky boy. I hope he continues his interest in baking. Maybe he could work for Duff Goldman someday and wear that jacket he got from him. The cupcakes look very yummy!! It's sounds like you all had a great time...I'm so glad you enjoyed your time away and what a wonderfl surprise for Benjamin !!!! Sooooo cool !!! Love ya!!! Do ya miss me...huh....do ya...do ya ????? omg. We're going to Tahoe this week. I'm going the North way just to get my hands on some of those cupcakes! and for some reason... I keep singing, "It's a small world after all... it's a small world after all..."